Germany’s DAX fell on Tuesday as uncertainty over a U.K. exit from the European Union and deal talks over a Greek bailout weighed on market valuations. For Tuesday the DAX was lower by -62.71 points or -0.63 percent to close at 9,890.19 after the market was closed on Monday for a holiday. Losses were led by manufacturing companies RWE AG and Continental AG. RWE was down -0.48 points or -3.92 percent to close at 11.80 EUR. Continental AG was down -5.27 points or -2.78 percent to close at 183.90 EUR. For Tuesday, the DAX Volatility Index was up 4.54 percent to 23.04 with added uncertainty over a U.K. exit from the European Union. Investors are closely watching political discussions in the U.K. as Germany has been cited to be one of the countries most affected by an exit from the U.K. Eurozone deal talks over reduced interest payments for Greece in ongoing discussions over a Greek bailout deal also highly affected market trading in Germany Tuesday, adding increased volatility. In other European markets, the FTSE 100 closed at 6,167.77 for a gain of 16.37 points or 0.27 percent. The FTSE 250 was also higher, closing at 16,845.08 for a gain of 145.76 points or 0.87 percent. France’s CAC 40 was down 4,297.57 for a loss of -14.71 points or -0.34 percent. The Stoxx Europe 600 traded flat at 334.72 for a loss of -0.01 points. The Stoxx Europe 50 was down -0.20 points or -0.01 percent to 2,801.13. The Europe Dow was also down, closing at 1,532.31 for a loss of -0.80 points or -0.05 percent. In Asia, stocks traded mostly higher. The Nikkei 225 in Japan was up 186.40 points or 1.13 percent to 16,652.80. Hong Kong’s Hang Seng Index was also higher, closing at 20,118.80 for a gain of 234.85 or 1.18 percent. In India, the S&P BSE Sensex gained 120.38 points or 0.47 percent to close at 25,773.61 and the NSE Nifty was higher by 30.00 points or 0.38 percent to close at 7,890.75. In China, the Shanghai Composite was lower on Tuesday, down -7.18 points or -0.25 percent to close at 2,843.68. In the U.S., stocks reacted broadly to ongoing global issues including the risks of a U.K. exit from the EU and ongoing deal talks over a Greek bailout. Trading slightly lower in mid-afternoon trading the Dow Jones Industrial Average was down -82.12 points or -0.46 percent to 17,628.59. 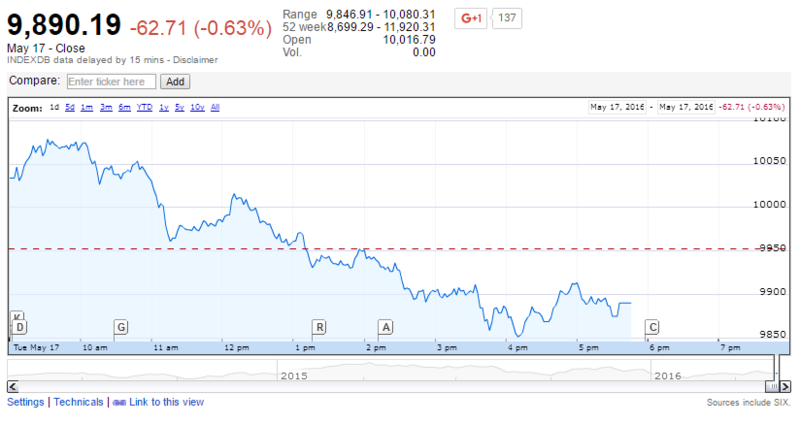 The S&P 500 Index was down -8.71 points or -0.42 percent to 2,057.95. The Nasdaq Composite was lower by -22.51 points or -0.47 percent to 4,751.55. U.S. economic indicators were also on close watch Tuesday in the U.S. as consumer price inflation data was higher than consensus as reported by the Consumer Price Index. However, while inflation was higher, improvements in industrial production and housing were reported in the U.S. on Tuesday. Monthly industrial production was up 0.7 percent in a report Tuesday and seasonally adjusted housing starts on an annualized basis were reportedly above consensus at 1.172 million.